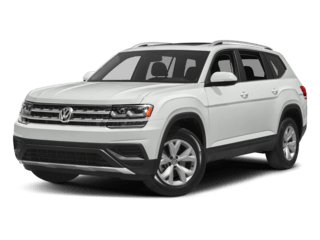 All-new and assembled right here in the United States, the Volkswagen Atlas is the largest VW to ever been assembled in America. Production has already begun and the Atlas is set to arrive in dealerships come spring of 2017. Volkswagen claims that this is the “biggest and boldest” vehicle it has ever built in the U.S. and that it’s designed for the modern American family. The first sport utility vehicle by Volkswagen designed with a third row of seating, the 2018 Volkswagen Atlas in Chicago, IL is able to seat a total of seven passengers. (Third-row seating is actually spacious enough to fit two adults.) Traditionally known as a car company, this is an exciting new adventure for Volkswagen, and that’s exactly what the Atlas is about, adventure. Two engines are available to the Volkswagen Atlas, a 2.0L turbocharged 4-cylinder that is capable of 238 horsepower or a 3.6L VR6 engine with 280 horsepower. Both engines are paired to an eight-speed transmission. The Volkswagen Atlas comes standard as a front-wheel drive vehicle while there are all-wheel drive models as well. The 4Motion all-wheel drive system is available on VR6 trims and comes with a Driving Mode Selection feature. Located directly behind the steering wheel of the Atlas is a 12.3” Active Information Display which provides pertinent information like: speed, fuel consumption, Driver Assistance settings, navigation, and more. Crossovers and family SUVs have been slaying their niche in the automotive market for years now, continuing to grow and become more popular each and every year. This is the largest SUV that Volkswagen has produced, and its dimensions reside at: 198.3” long, 77.9” wide, and 69.6” high. Seating/Cargo: There are some vehicles that require the flexibility of a contortionist to climb in and out of the third row, awkwardly having to duck as you squeeze past the second row and stumble in. Fortunately, the Volkswagen Atlas has created easy third-row access; a lever makes life much easier, sliding the seats forward to make a pathway to the third row which can comfortably seat two adults. And while there is plenty of room behind the third and second rows of seating, if you need even more space for cargo, both of these rows can be folded down. In total, cargo space extends up to 96.8 cu-ft of flexible room. To learn more about the safety, features, and five trim levels available to the 2018 Volkswagen Atlas or take it for a test drive, we would like to welcome you here to Jennings VW.